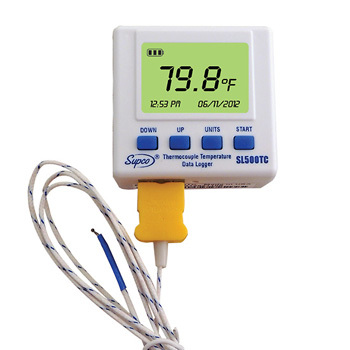 Supco SL500TC Thermocouple Logger With Display – Infinity HVAC Spares & Tools Pvt. Ltd.
Stores up to 32,638 temperature points. Operator’s manual included in software. Type K insulated thermocouple wire 40″. Compact, light weight, simple to use. 3 – AAA (Alkaline or Lithium recommended) Included. 30 character user ID field. Recording Start, on button, immediate after setup, or user specified date & time. System requirements: 5MB free disk space, 800 x 600 screen resolution, 1 free USB port. Password protected, user selectable single point offset calibration available through software. LCD real time display of temperature (°F or °C), time, date, alarm status, logging status, and battery life. User selectable stop on memory full, or memory rollover for continuous logging. Compatible with Windows® XP, Vista and Windows® 7/8 & 10. Displays alarm icon for high/low alarm status. Supplied probe rated -40°F to 500°F (-40°C to 260°C).